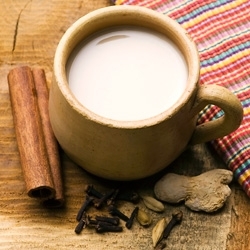 Delicious and low-calorie, this hot beverage treat delivers a shot of riboflavin, thanks to the fat-free milk! In a small saucepan, combine the water, ginger, cinnamon, and cardamom pods. Bring to a boil. Add the milk, reduce the heat, and simmer 5 minutes. Remove from the heat and add the tea bags. Steep for 3 to 4 minutes. Strain through a sieve or coffee filter. Add the brown sugar. Serve immediately, or chill and serve over ice.